Someone says that start your romantic love story from love homeland in rustling of pines, babbling of waterfalls and stand by your half to aspire together on Lang Biang Mountain which is symbol of eternal love between Lang and Biang. That is reason why Da Lat is one of the most impressive destinations for honeymoon tour in Vietnam. Love Valley attracts to Vietnamese as well as foreign tourists because of its natural romances and spectacular landscapes. Besides, thank to investment from human, this valley also creates unforgettable feeling for visitors. 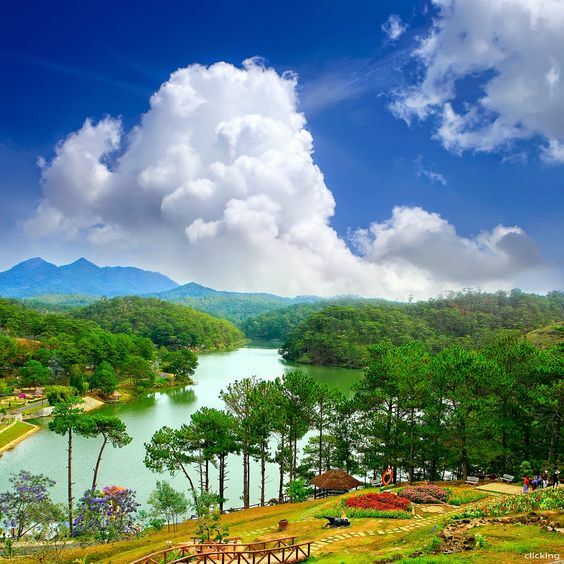 Touring the Valley of Love, visitors can find their way to Vong Canh Hill, which is regarded among the best destinations for sightseeing in Da Lat. Behind lines of pine trees are geese peacefully swimming in the tranquil lakes. In the distance is Langbiang Mountain covered in clouds. It is also an attraction for lovers to come and learn about the love of K’lang and H’biang in the legend of the K’Ho people. Going over the small bridge, tourists will reach Dia Dang Hill, a scenic place surrounded by lakes. Wandering around the Valley of Love, one should not miss the love lock bridge, which has long been the place for lovers to show their love and wish for endless affection by attaching a lock to it. Besides enjoying the breathtaking scenery there, tourists are excited about a huge “magic faucet” lying in the air. There are also several other activities to enjoy like swan boat pedaling, canoeing, tandem biking, horse riding, ancient train touring, and visiting gardens. Visitors to the Valley of Love can also go camping, enjoy can wine, or use teambuilding services with adequate facilities. The place is often chosen to host the annual festival celebrating Valentine’s Day (February 14) in Da Lat. Anyone travelling to Da Lat also utters “Wow, what a beautiful land.” Da Lat is wonderful in not only tourists but also people who have yet set their foot in this land. Da Lat is like a magnet attracting travelers thank to gorgeous waterfalls, dew illusion of flowers, and cool water of Xuan Huong Lake. In Da Lat, visitors can comfortably enjoy natural beauty and mix themselves with romantic love story bringing gentle moments in order that they forget difficulties, narrow in their daily life. Besides, Da Lat city is known for its famous architecture. Many researchers said that Dalat was Paris of Vietnam with unique, luxury villas. 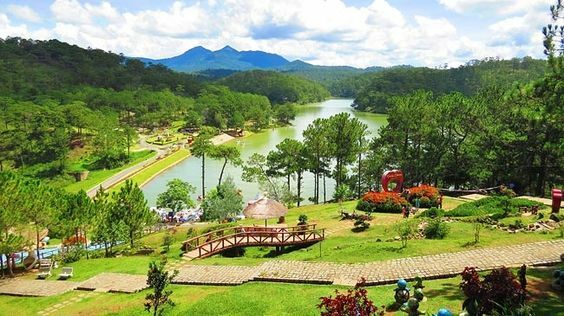 Thanks to its recognized attraction, Dalat becomes one of ideal destinations of holiday for couples in Vietnam. Highland city’s value always sustainable develops along with the name “Love City”.